Packing Tips to Help Your Move Go Off Without A Hitch! Planning is key! Be sure to have the right boxes, and plenty of packing tape, paper, and pads. You don’t want to realize you don’t have enough supplies the night before your move, adding unneeded stress to an already stressful process. Give us a call and we can help you figure out what you might need, answer any questions you might have about packing specific items, or even set you up with our professional packing service. 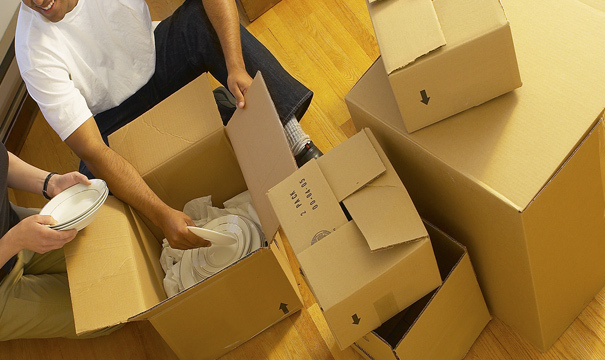 Properly labeled boxes make the whole move process much easier from start to finish. With properly labeled boxes, you can easily keep track of your items, your movers can quickly and efficiently place your belongings in their desired rooms at the new home, and you can have easy access to things you might need right after the move. For most moves, any time that we save unloading your goods, is time that you're not paying for on your bill. Make sure your boxes are packed tightly. Any free space in the boxes for your items to move around in transit dramatically increases the chance that something may be broken. Pack any free spaces in the box tightly with crumpled up paper, linens, or clothes. Let us know if you have any antiques, paintings, or anything else that you think might need special care. Sometimes these items will have to have special “crates” made to secure them during transit. Make sure your boxes are sealed tightly! Don’t skimp on the tape! Saving money on a couple rolls of tape won’t make a difference if even one of the boxes isn’t taped up properly and breaks open. When packing breakables, be sure to individually wrap each item in the box. If you’re packing dishes, do not stack, but put them in the box on their sides. You can bundle up individually wrapped breakables such as plates in order to keep them together when unpacking. Use the right boxes for the right items. Use smaller boxes for heavier items like books, CDs, DVDs, or paper files. If you put these in larger boxes, they can get very heavy very quickly, which can make them unwieldy for yourself and the movers, or even cause the boxes to break under their own weight. If you’re taking apart any of your own furniture before the move, it helps to tape any parts you might need for reassembly to the main base of the furniture. This just saves time and frustration at the other end of the move. If possible, use the original boxes for any electronics you may have, like computers, stereos, etc. If you don’t have the original box with the foam inserts (if included), then be sure to use lots of bubble wrap. It’s always a good idea to pack and unpack your breakables on a padded surface. Nothing is worse than getting through a long move only to break your favorite piece of china when pulling it out of the box! Make an “essentials” box. Even after the move is done, it can be very stressful looking for that “one thing you need”. Put everything you might need into a single box and label it appropriately. It will make that first night in your new home much more enjoyable to have all that at your fingertips. If you follow these tips, you can rest easy knowing your belongings will show up just as you packed them.